This is a Simple Model Of Electric Motor with a single brush.The model is not so fast enough but its speed can be increased by increasing the motor armature current i.e. increasing the supply current and using a magnet of low magnetism but sufficient to move the round core (armature). To get the radio shack wire just look for an out dated Transformer in Electrical devices like Television,Radio etc.Be careful while removing the transformer core.The winding wire in the transformer would be a single lead wire with gold color insulation and this would be the best for Motor armature design.For a thicker wire you can use a single lead copper wire used in the Electric Power lines. A small Magnet can be easily obtained from the old speakers.Break out the other parts and remove the round magnet or the other option is that you can make permanent Magnet for yourself as described here. 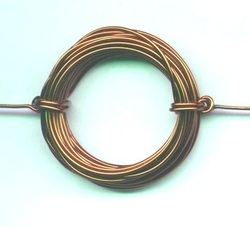 Wind the thin radioshack wire around the supporting devices like a pen or an AAA battery to get round shape.It need not be Essentially round exactly.Now leave a few inches at both the ends to wind the armature firmly as shown in the figure.The coil should winded tightly and knot should be made exactly at the opposite ends of armature as shown so that the armature is mechanically balanced when it held by holding it's extreme ends. Now start making the battery connections.To connect the battery to the moving armature the best choice is to provide a smooth symmetric and frictionless path.This can be done by winding a thick wire(Insulation removed) round the cylinderical surface as shown here. Connect this to the battery terminals and support it either on the battery holder or place it on a wooden piece. Now place the armature core in the supports and place the magnet either above or below the armature core arrangement as shown in the figure. It is evident that when battery is connected current flows from +ve end to -ve end through the armature core.The armature core when its bare ends(insulation free ends) are in contact with the conducting supports current flows in the coil round the coil.This circulating current in the perpendicular magnetic field produces an Electromagnetic Force perpendicular to both the current direction and the magnetic field causing rotation. The video clarifies you the whole process and also the direction of forces acting on the moving coil. The same force on the other side of core is equal in magnitude and opposite in direction.Thus this force produces a torque about the centre and hence the coil rotates. Thus the above equation shows that by increasing the number of turns the force increases and hence the torque and thus the no.of rotations per second also increases but at the same time its weight increases and hence the core may not be stable(either due to centrifugal force or the structure may bend at the centre due to its heavy weight).So a limited no.of turns are to be made both sufficient to produce necessary force for rotation and that the core is not too heavy. Why to remove insulation one half on both ends of the same side? It is necessary to wipe the insulation one half on both ends of the same side.This is necessary to form a current conducting path.This does not mean that all the insulation to be removed.If all the insulation is removed then current flows through the coil always(through out its rotation) and hence the forces produced always cancel each other. the coil may get heated when used continously. take care while using the knife to wipe the insulation.